Last sunday I gave the last touch to my two baby girl quilts (shown Here and Here), by hand sewing the binding on the back. This is something I like to do, and in general I enjoy finishing the details of my works by hand. I find this stage relaxing. Are you feeling the same when finishing a quilt? 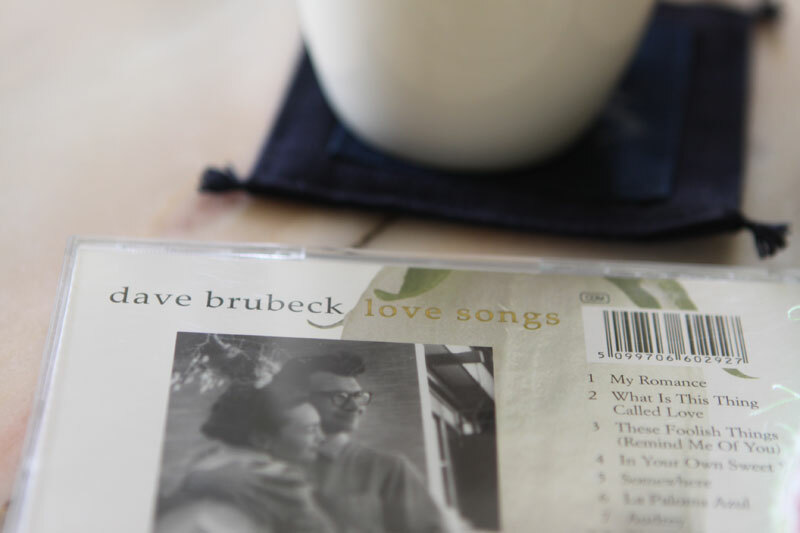 The house is quiet, the windows big open, I listen to Dave Brubeck playing jazz, I prepare a nice and warm mug of coffee... and this is... happiness! Happy stitches is so right!! I absolutely love your post as you caught the essence of the what and why I like about hand binding perfectly!!!! Sounds lovely!! I so enjoy hand sewing! Quiet contentment. 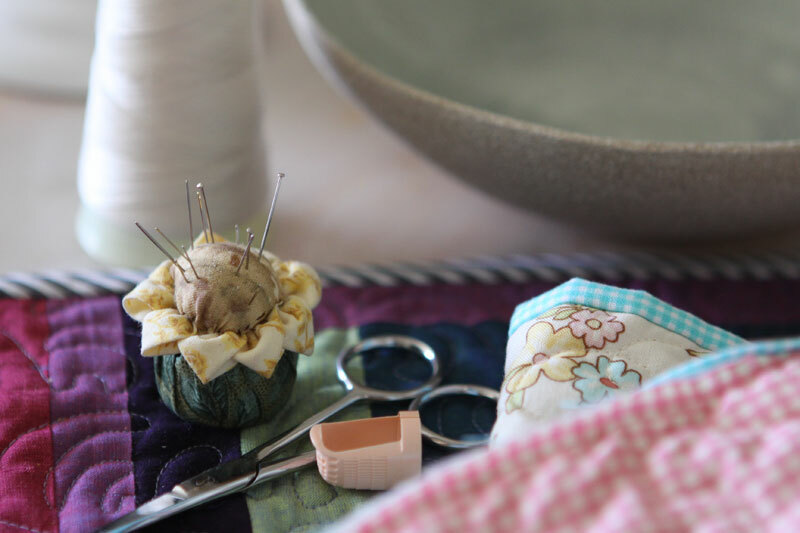 Love your little pin cushion! 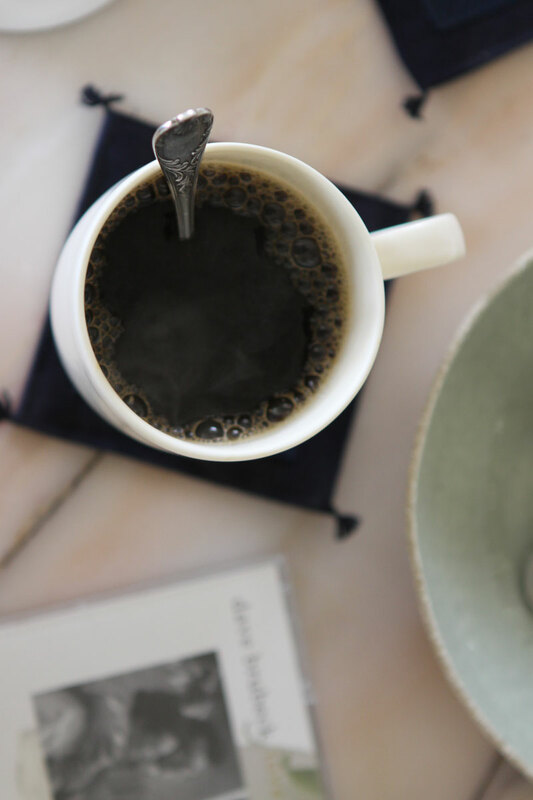 Sounds like a perfect afternoon. Sewing the binding down by hand is like sewing in the last of the happy thoughts from making the quilt. You just hit my RELAX button. What a great ending to a project. I always finish my binding by hand too. 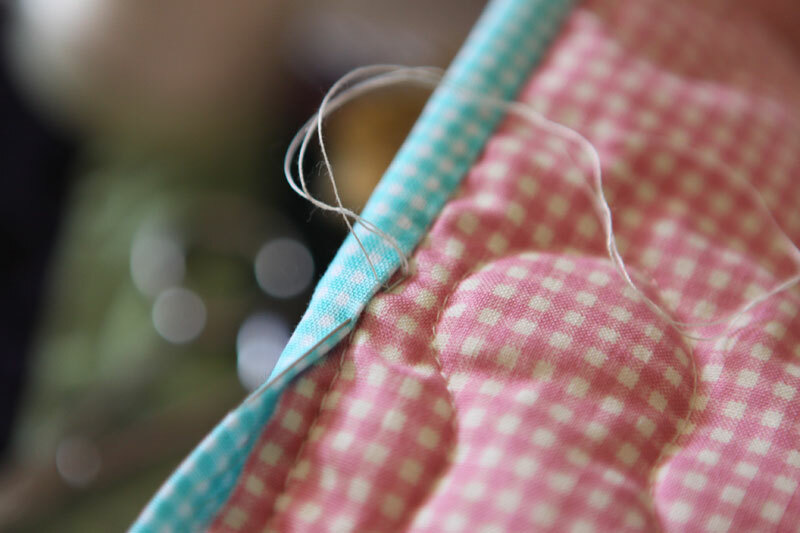 I just cannot get a neat stitch (as neat as by hand) with the sewing machine. And I prefer to do it comfortably seated in a comfy chair instead of sitting at the sweing table... more relaxing! I love finishing my binding by hand.....there's just something so relaxing about the repetitive motions. It also makes me feel more "connected" to the quilt, you know, giving it that last loving touch! I'm another one who loves to do hand-binding. Other than the fact it comes out much neater for me than doing it on my machine, I find it to be completely relaxing and very satisfying. Great job! I love hand sewing my bindings on. Its the final piece to the puzzle! I feel lost sometimes when I haven't any bindings to sew...very satisfying! I have to admit... I love to finish my bindings by machine. But your description of the process does sound very appealing. Got any big band music to go along with that? Glenn Miller is my fave! Yes I like finishing my binding by hand. Your pictures are beautiful! hopping over from Finished Friday from Richard and Tanya's quilts. lovely work, stop by my blog for giveaway. So Beautiful and I just want to sit there and quilt with cha..
what a beautiful photo essay. i just had a mini vaca! yes, i find this stage can be very relaxing. as long as the time is available and there are no deadlines, it can be truly enjoyable. 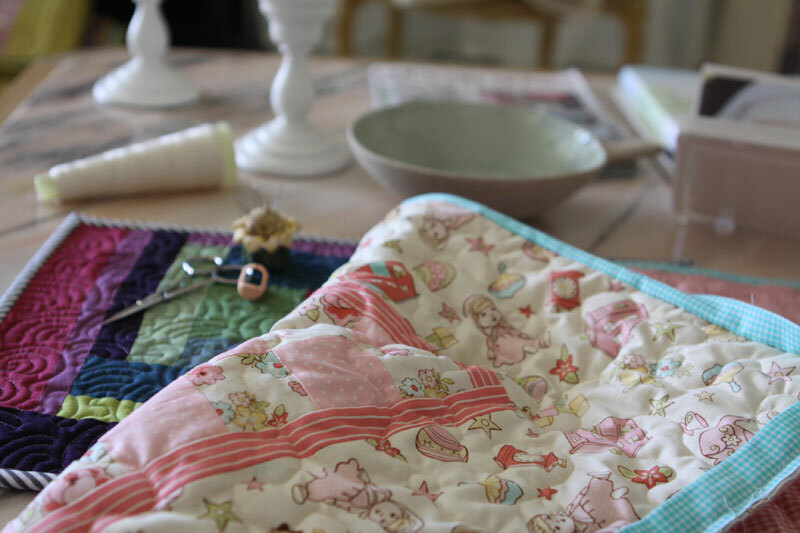 The baby quilts are just lovely and I am with you on the hand sewing. I find that when I try to sew on binding by machine, it never looks as good as hand sewing. And there is something relaxing about it. so sweet. While I don't feel this way about hand sewing binding, it's EXACTLY how I feel about the machine quilting. 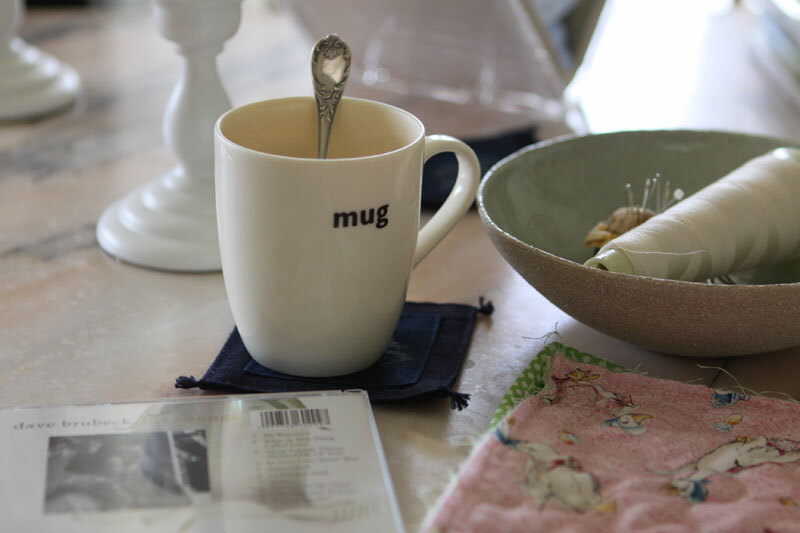 A nice cup of coffee, some of my favorite tunes, relax and just get lost in the quilting. I know the feeling even if it's for a different part of the process. There is nothing nicer than hand turned binding. It's the perfect ending. I love hand binding a quilt... one of my favorite things to do! Hand-binding is one of my favorites of the quilt-making process. Maybe it's because I am near a finish. But, mostly, it's because it is just so relaxing. Love the gingham checks in your sweet little quilt. Sounds like the perfect way to spend a slow stitching Sunday. I love the sweet gingham...nice to see it being used again. I love adding the binding too! Sounds like a lovely afternoon.